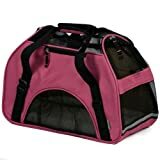 Found 56074 Cat Cat Products. 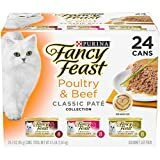 Fancy feast gourmet cat food, 3-flavor variety pack offers complete and balanced nutrition for adult cats, in a savory texture, marinated with real meat juices. This variety pack contains beef feast, turkey feast and chicken feast. Give us 7 days. We'll give you an odor-free home, guaranteed! 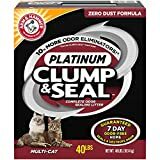 Arm & Hammer clump & seal platinum litter is a patented complete odor sealing clumping litter with a zero dust formula and 10% more odor eliminators than our clump & seal fresh scent formula. 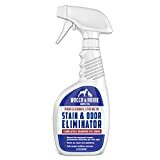 No other litter brand forms an odor-containing seal around urine and feces and destroys sealed-in odors on contact with unique, powerful odor eliminators and Arm & Hammer baking soda. 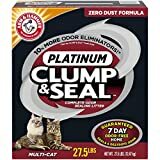 Extra strength formula powerful enough even for multi-cat homes. Serve your cat a meal that shows her just how much you care for her health with daily meals of Purina ONE Sensitive Systems premium adult dry cat food. This special blend nourishes adult cats with a carefully formulated recipe of nutritious poultry and other high-quality ingredients for your sensitive cat. Give your cat all of the protein and vitamins she needs to stay healthy and active for many years to come. As the top ingredient in this recipe, the real turkey used in Purina ONE Sensitive Systems premium adult cat food assists in delivering 36 grams of protein per cup to help support strong muscles while providing a hearty poultry flavor that your cat loves and gobbles up. Antioxidants and omegas help round out this 100% complete and balanced meal for your adult cat to provide a recipe that helps support her immune system and promote easy digestion while nurturing her sensitive skin. This crunchy kibble also helps reduce plaque build-up and whiten teeth.Turkey, Brewer's Rice, Corn Gluten Meal, Poultry By-Product Meal, Soybean Meal, Whole Grain Corn, Fish Meal, Dried Yeast, Powdered Cellulose, Soy Protein Isolate, Animal Fat Preserved with Mixed-Tocopherols, Soybean Hulls, Animal Liver Flavor, Phosphoric Acid, Caramel Color, Salt, Calcium Carbonate, Potassium Chloride, Dried Spinach, Choline Chloride, Taurine, Zinc Sulfate, Vitamin E Supplement, Ferrous Sulfate, Manganese Sulfate, Niacin, Vitamin A Supplement, Calcium Pantothenate, Thiamine Mononitrate, Copper Sulfate, Riboflavin Supplement, Vitamin B-12 Supplement, Pyridoxine Hydrochloride, Folic Acid, Vitamin D-3 Supplement, Calcium Iodate, Biotin, Menadione Sodium Bisulfite Complex (Source of Vitamin K Activity), Sodium Selenite. M-4188. :Turkey, Brewer's Rice, Corn Gluten Meal, Soybean Meal, Turkey By-Product Meal, Oat Meal, Animal Fat Preserved with Mixed-Tocopherols, Dried Egg Product, Whole Grain Corn, Animal Liver Flavor, Soybean Oil, Phosphoric Acid, Calcium Carbonate, Caramel Color, Salt, Potassium Chloride, Choline Chloride, Taurine, Vitamin E Supplement, Zinc Sulfate, L-Lysine Monohydrochloride, Ferrous Sulfate, Manganese Sulfate, Niacin, Vitamin A Supplement, Copper Sulfate, Calcium Pantothenate, Thiamine Mononitrate, Riboflavin Supplement, Vitamin B-12 Supplement, Pyridoxine Hydrochloride, Folic Acid, Vitamin D-3 Supplement, Calcium Iodate, Biotin, Menadione Sodium Bisulfite Complex (Source of Vitamin K Activity), Sodium Selenite. L-4186.Crude Protein (Min)...38.0%, Crude Fat (Min)...8.5%, Crude Fiber (Max)...4.3%, Moisture (Max)...12.0%, Linoleic Acid (Min)...1.4%, Calcium (Ca)(Min)...1.0%, Phosphorus (P)(Min)...0.9%, Zinc (Zn)(Min)...150mg/kg, Selenium (Se)(Min)...0.35mg/kg, Vitamin A (Min)...10,000 IU/kg, Vitamin D (Min)...800 IU/kg, Vitamin E (Min)...100 IU/kg, Taurine (Min)...0.15%, Omega-6 Fatty Acids* (Min)...1.5%. *Not recognized as an essential nutrient by the AAFCO Cat Food Nutrient Profiles. :Crude Protein (Min)...34.0%, Crude Fat (Min)...13.0%, Crude Fiber (Max)...4.0%, Moisture (Max)...12.0%, Linoleic Acid (Min)...2.3%, Calcium (Ca) (Min)...1.0%, Phosphorus (P) (Min)...0.9%, Zinc (Zn) (Min)...150mg/kg, Selenium (Se) (Min)...0.35mg/kg, Vitamin A (Min)...14,000 IU/kg, Vitamin E (Min)...450 IU/kg, Taurine (Min)...0.15%, Omega-6 Fatty Acids* (Min)...2.5%. *Not recognized as an essential nutrient by the AAFCO Cat Food Nutrient ProfilesAdult Cat Feeding: Fill your cat's bowl with the recommended measured amount every morning and allow your cat to eat on a "free choice" basis throughout the day, rather than as a single feeding at mealtime. Food intake required to maintain an ideal body condition will vary, depending on age, activity and environment. Monitor your cat's weight and adjust food amount accordingly. 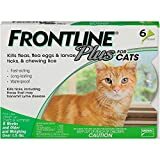 Making the Switch to Purina ONE: Although you'll be anxious to see the difference Purina ONE can make in your cat, please allow 7-10 days to ease the transition from your cat's current food. Each day, simply feed a little less of the previous food and a little more Purina ONE until you're feeding Purina ONE exclusively. This gradual transition will help avoid dietary upsets. Fresh Water, Proper Diet & Veterinary Care: Be sure to provide fresh water in a clean container for your cat daily. Proper diet, exercise and veterinary care are the best ways to keep your cat healthy. If your cat hasn't had a check-up in the past year, please make an appointment today. Feed Only One: A cats' digestive system works best when it receives the same food each day. Although humans crave variety in their diets, cats do not. Feeding different cat foods can turn your cat into a finicky eater. Avoid feeding table scraps, as they can upset the nutritional balance provided by your cat's regular food, and may lead to obesity. For questions related to the health of your cat, see your veterinarian. No Supplements Necessary: Purina ONE provides 100% complete and balanced nutrition for the maintenance of adult cats. there is no need to add vitamins, minerals or other supplements, unless specifically directed by a veterinarian. It's Not for All Cats: Purina ONE SmartBlend Indoor Advantage is specifically formulated for adult cats. If you have a kitten, or a pregnant or nursing cat, feed Purina ONE Healthy Kitten Formula. Store in a cool, dry place. :Fresh Water, Proper Diet & Veterinary Care: Be sure to provide fresh water in a clean container for your cat daily. Proper diet, exercise and veterinary care are the best ways to keep your cat healthy. If your cat hasn't had a check-up in the past year, please make an appointment today. 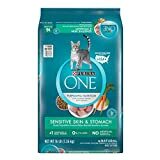 Making the Switch to Purina ONE: Although you'll be anxious to see the difference Purina ONE can make in your cat, please allow 7(en)10 days to ease the transition from your cat's current food. Each day, simply feed a little less of the previous food and a little more Purina ONE until you're feeding Purina ONE exclusively. This gradual transition will help avoid dietary upsets. It's Not for All Cats. Purina ONE Sensitive Systems is specifically formulated for adult cats. If you have a kitten, or a pregnant or nursing cat, feed Purina ONE Healthy Kitten Formula. Feed Only One: A cat's digestive system works best when it receives the same food each day. Although humans crave variety in their diets, cats do not. Feeding different cat foods can turn your cat into a finicky eater. Avoid feeding table scraps, as they can upset the nutrient balance provided by your cat's regular food, and may lead to obesity. For questions related to the health of your cat see your veterinarian. Adult Cat Feeding: Fill your cat's bowl with the recommended measured amount every morning and allow your cat to eat on a "free choice" basis throughout the day, rather than as a single feeding at mealtime. Food intake required to maintain an ideal body condition will vary, depending on age, activity and environment. Monitor your cat's weight and adjust food amount accordingly. No Supplements Necessary: Purina ONE provides 100% complete and balanced nutrition for all life stages of cats. There is no need to add vitamins, minerals or other supplements unless specifically directed by a veterinarian. Store in a cool, dry place.Purina trademarks are owned by Societe des Produits Nestle S.A. Any other trademarks are property of their respective owners. :Purina trademarks are owned by Societe des Produits Nestle S.A. Any other trademarks are property of their respective owners. Rachael Ray Nutrish Indoor Complete is a simple, natural food created to meet the specific needs of indoor cats. Real U.S. chicken is always the #1 ingredient, combined with a unique Superfood Blend to help with indoor cat concerns. It’s delicious, natural food with vitamins, minerals & taurine to help keep your indoor cat healthy & happy. And your cat will love our new kibble piece with the optimal crisp & crunch for a big taste with the ideal small size for your cat to chew & swallow. Your cat knows what they want, and knows how to get it. Give them SHEBA Wet Cat Food. Each SHEBA Wet Cat Food Pate recipe is made with real protein, essential vitamins, and minerals, so it’s as nutritious as it is delicious. 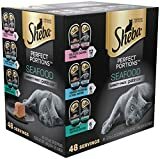 This wet cat food is made without corn and artificial flavors or preservatives; and since it’s so delectable and easy to chew, your cat will devour every tasty bite. SHEBA PERFECT PORTIONS Patés offer two convenient servings in right-sized trays to ensure freshness without leftovers. Show your cat some love; whether your fancy feline is a kitten, adult, or senior cat, this soft wet food is sure to satisfy even the pickiest appetite. Savor every delicious moment with SHEBA Wet Cat Food: What Cats Want. Wellness grain-free core indoor has 20% less fat than our Original formula. This protein focused diet contains no grain, corn, soy, wheat-gluten or artificial preservatives, meat by-products colors or flavors. 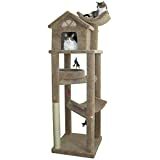 This attractive 62” cat tree can keep your feline friend busy. 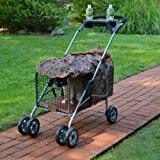 It is made from highly durable compressed wood, wrapped with high quality Faux Fur finish to keep your cats warmed and cozy. 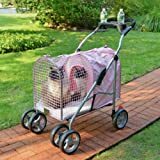 Unique features such as condo, ladder, hanging toys, tunnel, basket and top perch to keep your cat active and entertained. Multiple scratching posts are covered by natural sisal ropes which is perfect for your cats to scratch, climb, play and become active. 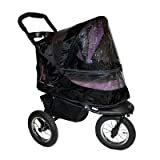 Easy to assemble with included tools and instructions. High protein, grain free recipes guided by our belief in raw, each recipe starts with responsibly sourced real meat and is made with 70%+ real animal ingredients & nutritious oils, 30% vegetables, fruits and other wholesome ingredients. We put the pure, real nutrition of raw on every piece of Instinct Original by tumbling our kibble with crushed, freeze dried raw – raising the bar in nutrition and taste. Instinct Original is a best selling cat food made with guaranteed levels of live, natural probiotics, natural omegas and antioxidants for digestive health, healthy skin & coat, and immune health. 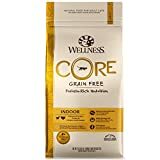 This grain free, gluten free cat food is made without grain, potato, corn, wheat, soy, by product meal, artificial colors or preservatives - ingredients known to trigger food sensitivity. 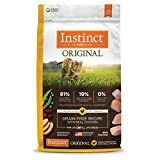 Instinct Original grain free cat food is complete and balanced nutrition for all cats, kittens, adult and senior, and is available in a variety of natural dry cat food recipes: Cage-Free Chicken, Cage-Free Duck, Farm-Raised Rabbit, Wild-Caught Salmon. Made in the USA with the finest ingredients from around the world and available in dry cat food and canned cat food pate. Satisfaction guaranteed. Questions? Call Instinct at 888-519-7387.